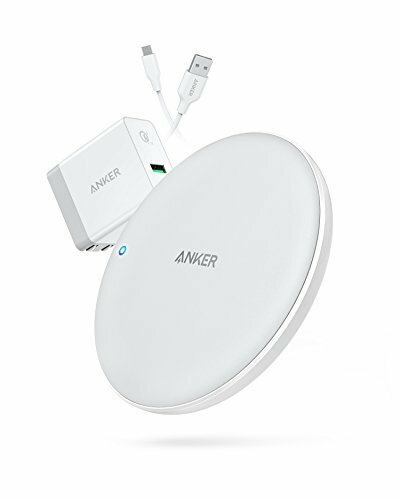 The wireless evolution of Anker's world-famous technology uses a high-efficiency chipset and an internal cooling fan (the first of its kind) to provide the fastest possible wireless charge in its class. Note: Cooling fan makes a sound during normal charging operation. Power any wirelessly-charged device in your arsenal at an uninterrupted 5W. Charging power is boosted to 7.5W for iPhone (as fast as Apple's proprietary wall charger), while flagship Samsung phones get a 10W extra-fast charge. Forget about "plugging-and-praying" with substandard chargers. Total radiation shielding, over-charge protection, foreign object detection, and more combine to provide peerless protection for you and your devices. - PowerWave is incompatible with the wall chargers provided with the phone by Apple and Samsung. - Metal attachments or credit cards will interfere with charging. - The included AC adapter does not have an LED indicator, to minimize distractions. What You Get: PowerWave 7.5 Pad, Quick Charge 3.0 AC adapter, PowerLine Micro USB Cable (3ft), welcome guide, worry-free 18-month warranty, and friendly customer service.